Singles Finalist Lea Van Der Zwalmen and Singles Champion Claire Fahey. The 2018 French Open was once again enjoyed by all those who took part. 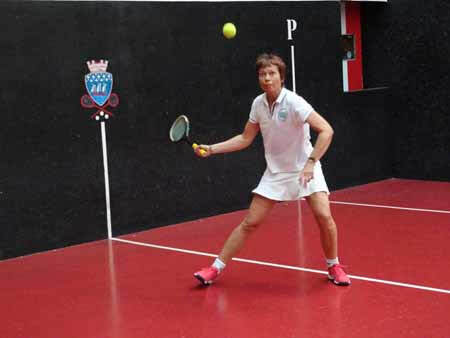 The singles competition saw World Champion; Claire Fahey as the top seed, followed by Rackets World Champion; Lea Van Der Zwalmen as the 2nd seed, Tara Lumley 3rd and her Mother, Penny Lumley as the 4th seed. 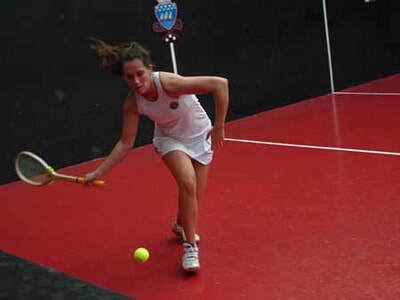 The first singles match of the tournament saw Alex Garside take on Claire Fahey (1); a match which was always going to prove challenging for Garside. However, she lapped up the opportunity of playing against the current World Champion and put on a fine display of tennis, even serving a railroad into the winning gallery. The final score line read 6/0 6/1 in Fahey’s favour. 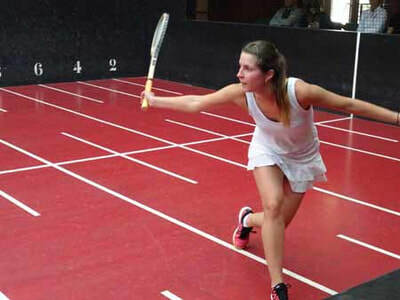 The second singles match was between Lea Van Der Zwalmen (2) and Nicola Doble, after the originally scheduled match between Jess Garside and Penny Lumley (4) was postponed due to sunlight issues on court, which would have caused dangerous play. 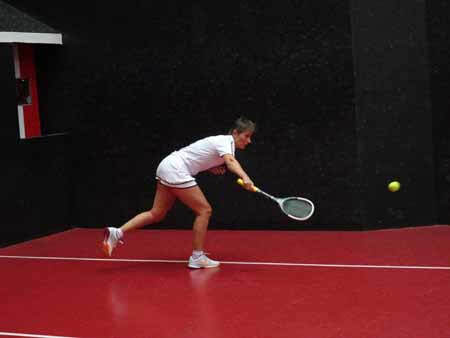 Both Lea and Nicola had been training hard in the weeks building up to the tournament, which was visible on court. 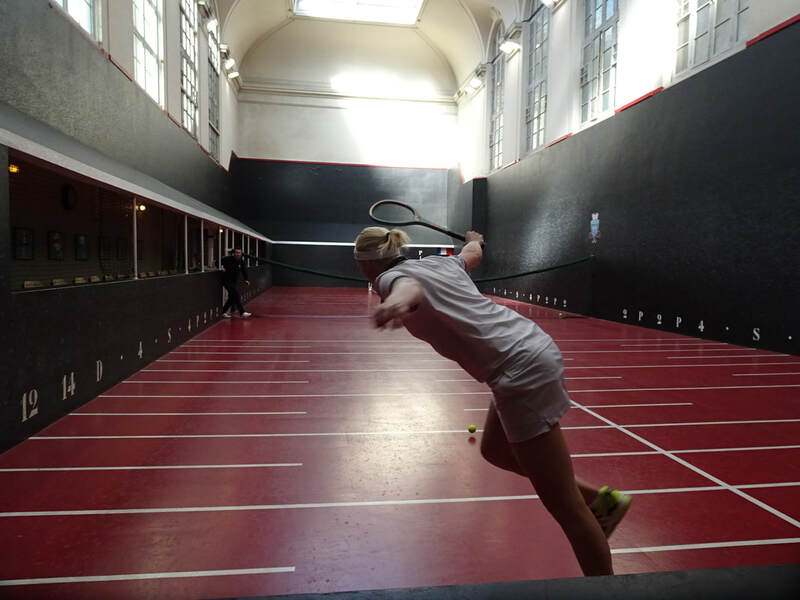 Whilst Nicola made use of her tight left handed railroads, it was Lea’s high serves with the height of the Paris court which gave her the upper hand, winning the match 6/1 6/1. 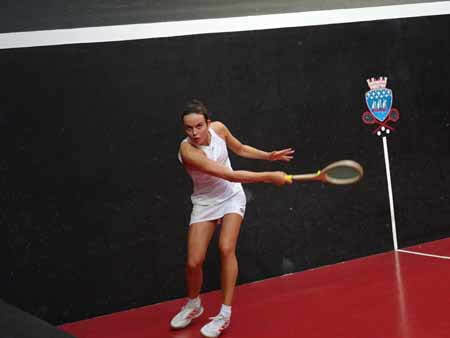 Following on from this was Tara Lumley vs Irina Dulbish; both of Lawn Tennis backgrounds and whom were partnering each other in the Doubles. With only a couple of points between their handicaps, on paper this was due to be a tight match. Despite some long and promising rallies, a determined Tara sought strength against a slightly less knowledgeable Irina on the court in Paris and saw her take the match 6/1 6/1. 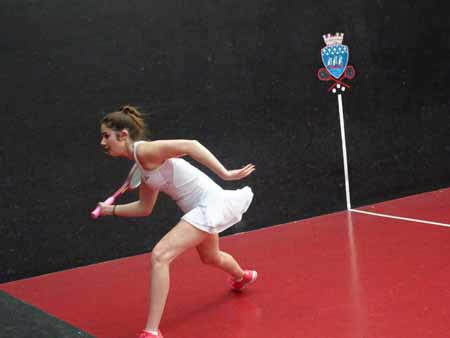 Next up was the previously postponed match between Jess Garside and Penny Lumley. Whilst Jess had never taken a set off Penny before, she dug hard and won the first set 6/3. However, a step on the pedal from Penny saw her storm back and take the 2nd set 6/2. This run continued for Penny in the 3rd set when she took a 3/0 lead, however hard work and determination from Jess brought her back in the set and even gave her a 4/3 lead. By far the closest match of the tournament so far, both Penny and Jess were neck and neck in the 3rd set; 4-4, 5-4 Jess, 5-5. Finally, it was Jess who kept her cool and took the match 6/3 2/6 6/5. On to the first day of the Doubles play in the competition, the first match took place between Claire Fahey & Nicola Doble (1) vs Penny Lumley & Alex Garside. Despite a new pairing for Fahey & Doble, the World Champion guided her partner and they proved too strong for Lumley & Garside. The final score line showing 6/0 6/1 and giving Claire Fahey & Nicola Doble a place in the Final. The second doubles match took place shortly after and saw Lea Van Der Zwalmen & Jess Garside (2) take on Tara Lumley & Irina Dulbish. A fiery start from Tara and Irina saw them take the first set rapidly against Lea and Jess, causing upset for the number 2 seeds and a well-needed wake up call. The second set saw Lea and Jess fight slowly back and whilst still being extremely close, resulted in a 6-4 win for the pair and 1 set all. The 3rd and final set allowed Lea and Jess to switch receiver and saw both pairs competing as best as they could. Neck and neck the whole way, both pairs were taking alternate leads throughout the set until Lea and Jess took a 5-4 lead. After defending numerous points against Tara and Irina to allow them back to 5-5, it was Lea and Jess who finally took the set and match 2/6 6/4 6/4 and gave them a well deserved place in the final. Straight back on court after an extended doubles match, it was Jess Garside to play her singles semi-final against Claire Fahey (1). A slightly tired Jess saw her enjoy the opportunity of playing the Ladies World Champion, but struggle to put her greatest effort in, resulting in a 6/0 6/0 win for Claire Fahey, seeing her through to the Final. The second singles semi-final was between Lea Van Der Zwalmen (2) and Tara Lumley (3). Despite a good 6 points difference between handicaps in Lea’s favour, Tara showed her potential and challenged the number 2 seed significantly. A confident Lea saw her take the first set with ease 6/2, but Tara on the attack kept her foot in the door until 5-5 in the second set, when Lea remained dignified to close the match 6/2 6/5, taking her through to both the Singles & Doubles Finals. The Doubles Final was up first, which consisted of the top seeded pair, Claire Fahey & Nicola Doble versus the second seeds, Lea Van Der Zwalmen & Jess Garside. Making the doubles final for a second year running, Jess and Lea were determined to improve their previous year’s score against the World Champion and her partner, where they were unable to take a game. With visibly more training and hard work put in, Lea and Jess put up a good battle against the top pair. However, Claire and Nicola proved too strong and took the title 6/3 6/3. 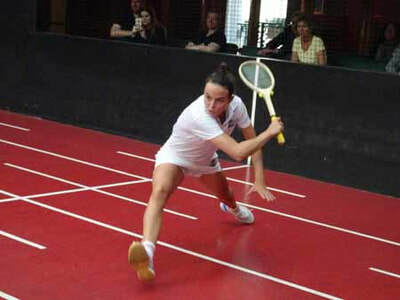 The Singles Final saw a seriously improving Lea Van Der Zwalmen challenge Claire Fahey. Having only entered her first ever tournament at the French Open in 2017, Lea had improved from a 33 to a 20 handicap within the year; an achievement which deserves recognition in itself. However, with still a little way to go before reaching Claire Fahey’s territory, the Final match was always going to prove tough for Lea. 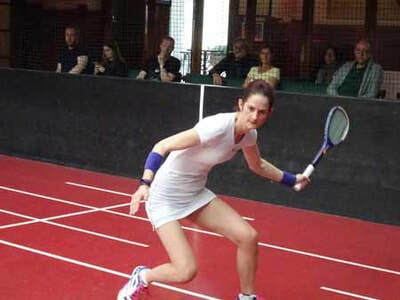 Despite putting in a brave and exciting effort, Claire proved herself once again, winning the title 6/1 6/3. Our thanks go to Tim Batten, Rod McNaughtan and the French Open organising committee for another successful tournament, as well as to all the sponsors, without whom the tournament would not be possible.